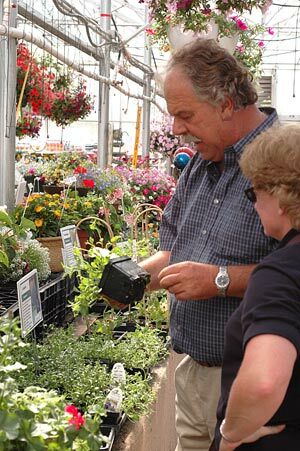 Jim Whiting Nursery Inc. has been in the nursery and landscape business in Rochester since 1972. He followed in the footsteps of his Father, Don and his Mother, Gladybelle for the love of the business who owned & operated Whiting’s Flower and Greenhouse. The first business was located on North Broadway, just north of Shopko from 1972 – 2003. From there he expanded to the existing retail garden center and greenhouses to 55 acres on 19th St NW. This has allowed us to do beautiful displays of a huge variety of flowers, trees, and shrubs. By focusing on the highest quality plant material, quality hardscapes and related garden center items along with a dedicated staff and excellent customer service we have become a strong leader in the industry. Jim considers his employees and their family’s part of the Whiting family. Our passion for your success in all your gardening endeavors is what separates us from the rest. Whether it’s planting a container garden or landscaping your home we strive to make sure you have quality plants and products to make your project a beautiful finish. From the beginning to the end we are here to serve you. Jim Whiting has had a long history of caring and sharing. He has supported numerous organizations throughout the area for many years. These organization include; Arbor Day, RNeighbors, Disabled Veterans, Wreaths across America, Ironwood Christian Ranch, Ronald McDonald House, Gift of Life Transplant House, Regional Science Fair, Sherriff Youth Programs, Rochester Art Center, and the National Eagle Center, along with many fundraisers. His caring attitude with his customers extends into the pet world. He has sponsored several auctions at the nursery that were very successful with all proceeds going to Paws and Claws. In memory of his special pet a yellow Labrador, SID, Jim donated his time and materials for the new paver patio, many shade trees and reseeding of grass area at the Jean& Karl Frank NW Canine Park on West Circle Dr.
At our Lake City location he keeps the streets in bloom by supplying the city with flowers for their planters and supports the Polar Plunge. Jim Whiting Nursery is proud to support the local Rochester and Lake City area community through our donation program. We can assist by providing gift certificates for a tree. Donations are provided on a first come-first served basis to groups/organizations within 20 miles of Jim Whiting Nursery and are issued based on available monthly allowances. Organizations are eligible for one donation every 12 months. Jim Whiting Nursery does not make cash donations or purchase advertising space for events.